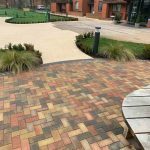 When choosing surfacing for any outdoor project, you’ll be looking for materials that are hard wearing and weather resistant all year round. You may also be looking at other factors including flexibility, cost or sustainability when choosing the right material for your project. 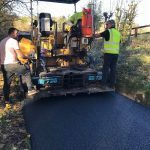 Whether you’re a contractor looking to lay a new road or a homeowner wanting to drop kerbs and create a new driveway, Reading Asphalt can provide high grade materials appropriate to your project and undertake all work to exacting standards. 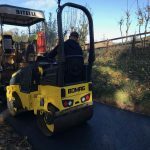 All work carried out by Reading Asphalt is completed to the highest British standard and guaranteed for between 2 and 5 years. We carry public liability insurance of £10,000,000 cover on all works. Increasingly homeowners are looking to park their car on their own property, rather than parking on the roadside. 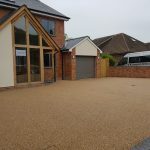 Should you have the permission from your local authority, driveways (planning permission only needed if using impermeable surfacing) and drop kerbs can provide you with parking space and an attractive, low maintenance entry to the front of your home. 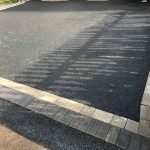 You can choose from either a smooth tarmac driveway or concrete bricks/blocks. 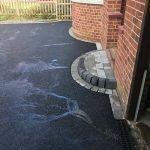 Benefits of choosing tarmac: Easy to install and quick to lay Incredibly strong and durable through the harshest conditions Easy to maintain and repair Benefits of choosing concrete: Non-slip surface, no skidding Tough and long lasting through any weather condition Minimal maintenance makes concrete long term cost effective As well as installing new driveways and dropping kerbs, we can also refurbish and restore your driveway including the removal of moss, algae and weeds and repairing joints. Ideal for relaxing with a book or dining with friends in the summer months, a patio space provides the perfect place to enjoy your garden. Outdoor furniture including table and chairs can easily rest on the surface unlike grass where the furniture could sink. You can choose from a selection of weather resistant materials including stone, concrete pavers, poured concrete, tile or brick. Choosing the best material for your budget and patio longevity With a broad range of materials providing durability, strength, flexibility and low maintenance, your new patio can come in on budget and give you an attractive looking outdoor space for years to come. For those on a high budget, brick and natural stone patio pavers have the most redeeming qualities of any patio material. For those on a moderate budget, quality concrete pavers are the best value option available. For those on a tight budget, poured concrete is an affordable choice and a strong material, although more susceptible to cracking than dearer alternatives. 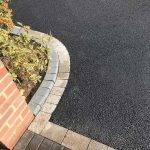 As well as installing new driveways and dropping kerbs, we can also refurbish and restore your driveway including the removal of moss, algae and weeds and repairing joints. Professional athletes and casual sports players alike need sports surfaces that can be relied upon for durability, flexibility and high performance - as much as the participants themselves. Your venue could benefit from the expertise and quality of workmanship of our team in providing specialist sports surfaces. 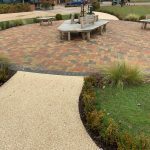 Whatever the requirements demanded on the surface, we can suggest appropriate options for Indoor or outdoor, non-slip, turfed or solid surfaces. Choose from a broad range of sports surfaces: Polymeric rubber surfaces - suitable for race tracks and MUGA (multi-use games areas) Turfed surfaces (natural and artificial) - suitable for rugby, football, soccer etc. Sand surfaces - suitable for 'beach' style events such as volleyball and netball PVC surfaces - suitable for gymnasiums and racquet sports such as tennis, badminton and squash Wooden surfaces - suitable for many indoor sports, popular for indoor basketball courts.